Lockheed Electra 10A "CF-TCC" in Trans-Canada Air Lines livery at the Western Canada Aviation Museum. Trans-Canada Air Lines (also known as TCA in English, and Air Canada in French) was a Canadian airline that operated as the country's flag carrier. Its corporate headquarters were in Montreal, Quebec. Its first president was Gordon Roy McGregor. In English-language contexts, the airline operated as TCA from 1937 to 1965, when it was renamed Air Canada. 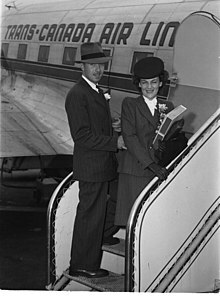 With heavy involvement from C. D. Howe, a senior minister in the Mackenzie King cabinet, TCA was created by the Crown Corporation Canadian National Railway (CNR), and launched its first flight on September 1, 1937, on a flight between Vancouver and Seattle. An air-mail contract with Canada Post was one of the methods by which TCA was financed. The creation of TCA was partly by CNR management who wanted to expand the company into the new field of passenger aviation, and was partly by government direction. Prior to TCA, no large national airline existed in Canada. With war looming, and other nations (primarily the U.S.) experiencing major increases in the creation of passenger airlines, it was necessary to have a presence. The CNR was the country's largest corporation at the time and proved an effective vehicle for the government to create a national airline. TCA was also in direct competition with passenger trains operated by parent CNR, and contributed to the decline of passenger rail service as Canada entered the pioneering years of air travel. In response to CNR's creation of TCA, arch-rival Canadian Pacific Railway created Canadian Pacific Air Lines in 1942. Between 1943 and 1947, TCA operated the Canadian Government Trans-Atlantic Air Service (CGTAS) to provide trans-Atlantic military passenger and postal delivery service using Avro Lancastrian (modified Avro Lancaster) aircraft. The record crossing was completed non-stop in 12:26 hours; the average was about 13:25 hours. CGTAS ushered in the era of commercial air travel across the North Atlantic. After the war, the Lancastrians became part of TCA and carried paying civilian passengers until they were replaced by Douglas DC-4s. Starting in 1945, TCA acquired 30 twin-engined ex-military Douglas DC-3s for use on Canadian internal services and some of these remained in service until 1963 on shorter routes. A fleet of Merlin-powered Canadair North Stars was delivered from 1947 and these commenced services to several European countries, including the United Kingdom and to cities in the USA. The last of the North Stars was sold in 1961. The Canadair North Stars were gradually replaced by longer range Lockheed Super Constellations from 1954 onwards, fourteen being operated on transatlantic routes extending as far as Vienna in Austria; also to Bermuda and several Caribbean destinations including Jamaica and Trinidad. The last Super Constellations were disposed of in 1963. A large fleet of Vickers Viscount turboprop airliners was built up from late 1954 and these were used on many intra-North American routes. The Viscount was followed by the larger Vickers Vanguard turboprop. TCA was the only airline in North America to operate the Vanguard in scheduled passenger service. In 1953 with the development of ReserVec (originally called Gemini), TCA became the first airline in the world to use a computer reservation system with remote terminals. The airline's Winnipeg maintenance shops and its first trial flight of the Viscount was documented in the 1955 film, Routine Flight. The airline acquired a fleet of Douglas DC-8 jet airliners powered by Rolls Royce Conways, the first being received on 25 May 1960. The DC-8 quickly replaced the slower Super Constellations on TCA's scheduled services to Europe. In 1964, an Act of Parliament proposed by Jean Chrétien changed the name of Trans-Canada Air Lines to "Air Canada", which was already in use as the airline's French-language name, effective 1 January 1965. In 1978, Air Canada was divested by parent CNR and became a separate Crown corporation. Air Canada was privatized in 1989. 18 November 1938 Lockheed 14H-2, Fin 34 CF-TCL was on a flight from Winnipeg, Manitoba to Vancouver, British Columbia with a load of mail. After a stop in Regina, Saskatchewan, the aircraft crashed after takeoff, killing both pilots. 6 February 1941 Lockheed 14H-2, Fin 38 CF-TCP was landing at Armstrong, Thunder Bay District, Ontario during the night and crashed a mile short of the airport. A total of nine passengers and three crew were killed. 4 November 1943 Lockheed 18 Lodestar, Fin 46 CF-TCX lost power to both engines on takeoff from Toronto-Malton Airport and landed in a field. There were no injuries, but the aircraft was written off. 28/29 December 1944 Avro Lancastrian, Fin 102 CF-CMU crashed into the sea off the Azores during a nighttime eastbound Atlantic crossing. There were no survivors. 27 February 1945 Lockheed 14H-2, Fin 28 CF-TCF written off at Moncton, New Brunswick. 1 July 1945 Avro Lancaster, Fin 100 CF-CMS crashed and burned at Montreal-Dorval International Airport after a training flight. 2 September 1946 Lockheed 14H-2, Fin 32 CF-TCJ crashed at Moncton, New Brunswick during training, killing two pilots. 23 January 1947 Lockheed 14H-2, Fin 39 CF-TCQ crashed near Winnipeg, Manitoba, killing two pilots. 28 April 1947 Flight 3 Lockheed 18 Lodestar, Fin 53 CF-TDF disappeared in southwestern British Columbia with 15 people on board with no survivors. The crash site was discovered 47 years later, in September 1994, on Mount Elsay in North Vancouver, B.C. 12 August 1948 Canadair DC-4M-1 North Star, Fin 185 CF-TEL crash-landed in flames short of the Sydney, Nova Scotia runway. All 11 passengers plus crew escaped. 8 April 1954 Flight 9 RCAF Harvard Mark II #3309 collided in midair with TCA Canadair C-4 North Star, Fin 223 CF-TFW over Moose Jaw, Saskatchewan, killing 36 (Harvard: pilot, North Star: 31 passengers, four crew) people on the aircraft and one person on the ground. 17 December 1954 Lockheed 1049E Super Constellation, Fin 407 CF-TGG crashed after takeoff from Brampton, Ontario with all 16 passengers and seven crew surviving. The captain of this flight later died in a crash in 1957. 9 July 1956 Flight 304 Vickers Viscount, Fin 610 CF-TGR propeller separated from the turboprop over Flat Rock, Michigan, slicing into the cabin and killing one passenger. 9 December 1956 Flight 810 Canadair DC-4M-2 North Star, Fin 204 CF-TFD crashed near Chilliwack, British Columbia after encountering severe icing and turbulence, resulting in the death of all 62 people on board. 10 November 1958 TCA Vickers Viscount, Fin 604 CF-TGL parked at Idlewild Airport, New York was destroyed by fire while awaiting passengers after it was struck by Seaboard & Western Airlines Lockheed 1049D Super Constellation N6503C which had crashed while taking off. The two crew members on board survived the accident. 3 November 1959 Vickers Viscount, Fin 617 CF-TGY was written off when it landed short of the runway at Toronto-Malton Airport. All 40 on board survived. 10 October 1962 Flight 455 Vickers Viscount, Fin 619 CF-THA was involved in a ground collision with CF-101 Voodoo 17452 of the Royal Canadian Air Force at RCAF Station Bagotville. The Voodoo had been given clearance to take off before the Viscount had cleared the runway. It collided with the tail of the Viscount, killing a flight attendant and a passenger. The crew of the Voodoo ejected, as the aircraft had been set afire as a result of the collision. The Viscount was substantially damaged, but it was repaired and returned to service. 6 November 1963 Flight 861 Douglas DC-8 was taking off from runway 28L at London Heathrow Airport on a flight to Montreal, Quebec with seven crew and 90 passengers on board. As the aircraft passed 132 knots on its takeoff roll, the captain pulled back on the control column. He mistakenly believed there was no response from the elevators, and he aborted the takeoff. As a result, the aircraft passed the end of the runway and it came to rest 800 yards past the end of the runway in a cabbage field. All passengers and crew on board survived the accident, and the aircraft was repaired and returned to service. 29 November 1963 Flight 831 Douglas DC-8-54F, Fin 814 CF-TJN crashed shortly after takeoff from Montreal-Dorval International Airport, resulting in the deaths of all 118 people on board. One former TCA Lockheed L-1049G Super Constellation (CF-TGE), has been preserved by The Museum of Flight in Seattle, Washington. It is currently on display at the Museum's "Airpark" attraction. A former TCA Vickers Viscount (CF-THG) is on display at the British Columbia Aviation Museum in Sidney, British Columbia. The aircraft has been completely refurbished by the museum. ^ McGrath, T.M. (1992). History of Canadian Airports (2nd ed.). Ottawa: Lugus Publications in co-operation with Transport Canada. ISBN 978-0-921633-11-2. ^ Canadian Encyclopedia online, article on the "Postal System"
^ "Lancasters After The War." Bomber Command Museum. Retrieved: 3 October 2011. ^ "Canadian Review." Flight, 9 January 1947, p. 44. Retrieved: 3 October 2011. ^ "Claude Ivan Taylor." Archived 2011-08-13 at the Wayback Machine Canada's Aviation Hall of Fame. Retrieved: 3 October 2011. ^ Whittle 1967, pp. 84–85. ^ Marson 1982, p. 254. ^ "ReserVec: Trans-Canada Air Lines' computerized reservation system ." IE Explore. Retrieved: 3 October 2011. ^ Burwash, Gordon and McLean, Grant. "Routine Flight" (Documentary film). National Film Board of Canada, 1955. Retrieved: 18 July 2012. ^ "List of Trans-Canada Air Lines accidents." Aviation Safety Network. Retrieved: 13 January 2011. ^ "Accident description: Lockheed 18 Lodestar, 28 April 1947." Aviation Safety Network. Retrieved: 28 April 2012. ^ Durfree, James R; Gurney, Chan; Denny, Harmar D; Minetti, G. Joseph (1957). CAB Accident Investigation Report: Trans-Canada Air Lines Viscount, CF-TGR, Flat Rock, Michigan, July 9, 1956 (PDF). United States Civil Aeronautics Board. ^ "Accident description: TCA Vickers Viscount, 10 November 1958." Aviation Safety Network, 7 September 2009. ^ Accident description: TCA Vickers Viscount, 3 November 1959." Aviation Safety Network, 1 September 2009. ^ "Accident description: TCA Vickers Viscount, 10 October 1962." Aviation Safety Network, 7 September 2009. ^ ""Accident description: TCA Douglas DC-8, 6 November 1963." Aviation-safety.net, Retrieved: 13 December 2010. ^ "Historic Fleet." Air Canada. Retrieved: 3 October 2011. ^ "Connie." rbogash.com. Retrieved: 13 December 2010. ^ "Super Constellation CF-TGE." rbogash.com. Retrieved: 13 December 2010. Blatherwick, John. A History of Airlines in Canada. Toronto: The Unitrade Press, 1989. ISBN 0-919801-66-8. Bliss, Michael. Northern Enterprise: Five Centuries of Canadian Business. Toronto: McClelland and Stewart, 1994, 1990, First edition 1987. ISBN 0-7710-1569-0. Harbron, John D. C.D. Howe (The Canadians). Don Mills, Ontario: Fitzhaven and Whiteside Limited, 1980. ISBN 0-88902-226-7. Marson, P.J. The Lockheed Constellation Series. Tunbridge, Kent, UK: Air-Britain (Historians) Ltd, 1982. ISBN 0-85130-100-2. Pigott, Peter. National Treasure: The History of Trans Canada Airlines. Madeira Park, BC: Harbour Publishing, 2001. ISBN 978-1-55017-268-3. Render, Shirley. Double Cross: The Inside Story of James A. Richardson and the Canadian Airways. Vancouver: Douglas & McIntyre, 1999. ISBN 1-55054-722-4. Smith, Philip. It Seems Like Only Yesterday: Air Canada, the First 50 Years. Toronto: McClelland and Stewart, 1986. ISBN 0-7710-8211-8. Whittle, John A. et al. The Douglas DC-4 and Canadair 4. Tonbridge, Kent, UK: Air-Britain (Historians) Ltd, 1967. This page was last edited on 13 March 2019, at 22:43 (UTC).